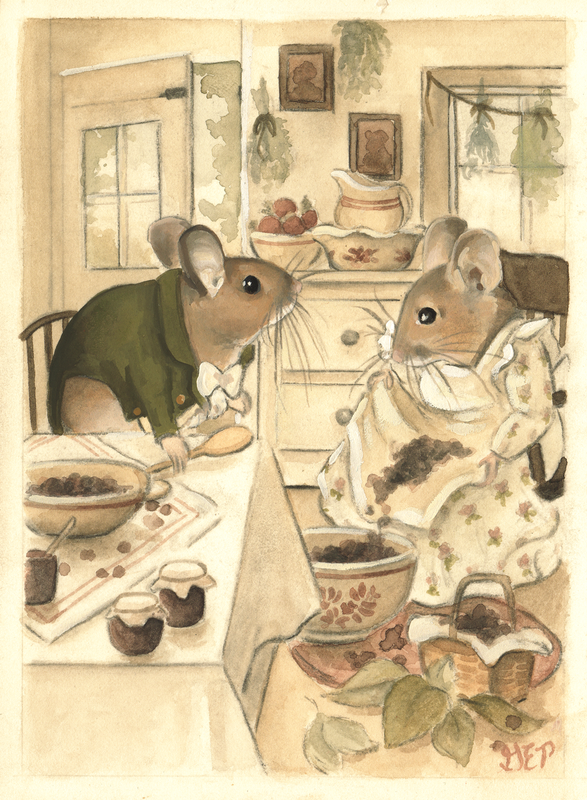 I have been working on a companion set of paintings to illustrate the classic Aesop's Fable, The Town Mouse & the Country Mouse. The first one takes a peek though the briers and brambles into the modest abode of a little country field mouse. She has invited her well-to-do cousin, who lives in town, to visit her. He happens to arrive during blackberry season, and so he is just in time to partake in the art of preserving the harvest in the form of jams & jellies. Glancing over his shoulder, spoon in hand, he is looking to his cousin for instructions on the recipe. I will admit that I am a bit of a country mouse myself. Nothing like having bare feet in the grass reading a book, or snacking on wild fruit. In the next illustration (coming soon!) she will be visiting her cousin's home in town.